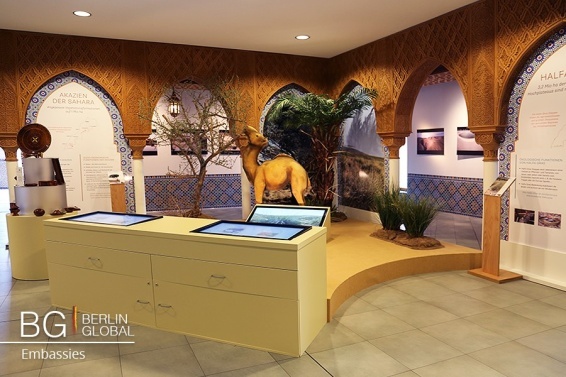 The Moroccan Embassy of Berlin has opened its exhibition in the Gardens of Worlds, Berlin. The exhibition can be found in the Oriental Garden and it is open from 6th to 28th April. With the exhibition, Morocco aims to show the other sides of the popular tourism country and the socio-economic importance of the biodiversity in Morocco. The exhibition entails information of the four different climate areas and the variety of vegetation growing there. The exhibition covers environmental differences from the northern parts with deep snow and flowery spring to the desert at the Western Sahara. The four touch panels allows visitors to see pictures and videos of the areas and learn more information about of the ecological, socio-economic, and the possible uses of the material gained form the terrain: argon oil used in cosmetics, honey form acacia tree, and traditional crafted wood panels and cases. There is also a separate electronic touch panel with headphones where English-speaking visitors can learn about the Moroccan cities and the specialties they are known of in the world. The exhibition also presents 3D trees that locates in different climate areas and artefacts produced from some of them. The exhibition intends to tell to the visitors that Morocco is currently committed to establish 10 national parks by 2020 and its aim is to cover around 800 000 hectares of Morocco’s terrain. There are also other conversation plans for biosphere and ecological areas that aims to protect nature to 2.5 million hectares in a way that the development and production would be sustainable. 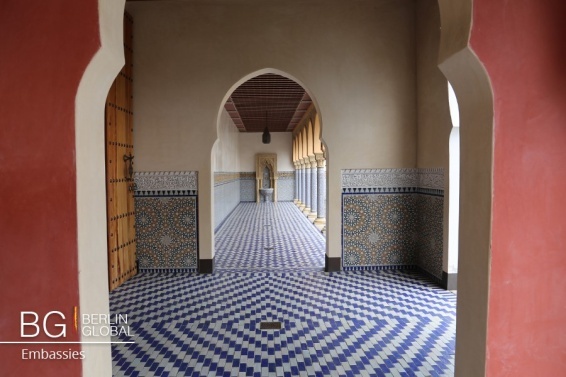 Oriental Garden was opened in 2005 by Moroccan and German experts with the intention for present different traditions from Islamic countries. The courtyard was based on the suras of the Quran and are surrounded by walls. The “Reception Hall” where the exhibition is held, was extension to the garden and it was build in 2007. The exhibition is in Gardens of the World - Hall of receptions, Oriental Garden, Eisenacher Strasse 99, 12685 Berlin and it is open from 9 am to nightfall.